A few notes on some of the Rules incidents at the 2016 Masters Championship. Regular readers of my blogs and ‘Rhodes Rules School’ weekly emails will not have been surprised that when the wind blew Billy Horschel’s stationary ball off the putting green into the hazard, he had to take a penalty drop. For example, see this blog from March last year. However, I guess that there are quite a few golfers who did not understand why he then dropped his ball close to the putting green, some way away from the water hazard. Remember, that one of the options to take relief from a water hazard under penalty of one stroke is to drop a ball where the last stroke was played from, Rule 26-1a. This was obviously a better option than dropping a ball on the opposite side of the water hazard on the ‘flagline’, an imaginary line from the hole through where the ball last crossed the margin of the hazard. There has been some discussion as to whether the referee made the correct ruling when giving Bryson DeChambeau relief from a temporary immovable obstruction (TIO) and path on his final hole on Friday. Whether the ruling was correct or not had no effect on Dechambeau’s score because he was acting under the guidance of the referee and cannot therefore be penalised for dropping and playing from the wrong place. If you are interested in the detail of the ruling I recommend the explanation from Ryan Farb, Californian Tournament Director and Rules Official, at this link. After completing his second round on Friday, Augusta National officials alerted Zach Johnson to a potential violation of the Rules of Golf on the 13th hole. 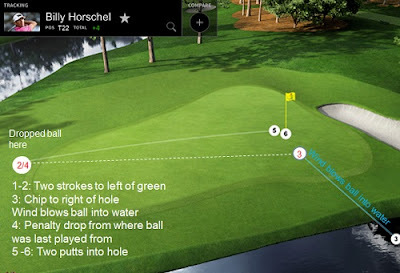 Johnson's third shot to the par 5 wound up in the water hazard in front of the green, and the reigning Open champion chose to play his ball out of the hazard. However, on his backswing, he grazed the water, which is considered grounding the club in a hazard in breach of Rule 13-4. Johnson was subject to a two-stroke penalty, which meant that he missed the cut. I am often asked which Rule of Golf I would change if given the opportunity. There are a few, but I would remove the penalty for touching ground in a hazard and water in a water hazard, as I cannot see that this gives a player any real advantage before playing their next stroke. The people suggesting that Bernhard Langer is anchoring are, a) entirely predictable, b) entirely wrong. Agreed! If you are not clear on this subject check out this blog of mine. Although permitted, this action looks awkward to me and there must be an increased chance that the player will accidentally cause their ball to move. If they do press down on their putter while it is in front of the ball (e.g. due to losing their balance in a strong gust of wind), the penalty is incurred. Holes-in-one are fairly uncommon, even in Pro Tournament play, but Shane Lowry, Davis Love lll and Louis Oosthuizen all achieved this feat on Augusta National’s 16th hole on Sunday. Louis’ was even more uncommon, as his ball deflected off the ball of JB Holmes into the hole for his hole-in-one. Of course, JB Holmes had to replace his ball where it was at rest before being moved by Oosthuizen’s ball. If you missed this rare incident check this link. A tradition at the Masters is that if there is an odd number of competitors that make the cut they do not permit the player in the last qualifying place to play by himself on the weekend. Augusta National bring in member and course record holder (61 from the members’ tees), Jeff Knox, as a non-competing marker, to play with the solo player to try and maintain a reasonable pace for the first tee time. In 2014 Knox was marker for Rory McIlroy and reportedly took money off him. On Saturday he played with Bubba Watson; there is no record of who had the better score and of course Knox is not obliged to hole out at every hole, though one suspects that he would want to. Email me at 'rules at barry rhodes dot com' if you are interested in purchasing my new eBook, ‘999 More Questions on the Rules of Golf’. 999 different questions in a new (and better!) format ($10.99, €9.99 or £7.99). Regaring Langer, the ruling has Note 2: An “anchor point” exists when the player intentionally holds a forearm in contact with any part of his body to establish a gripping hand as a stable point around which the other hand may swing the club. He may indeed be lifting his hand away from his body, but his forearm is against his shirt. Until I see daylight between the two I will keep my entirely predictable belief that he is anchoring. Perhaps the explanation from the man himself in this video link might persuade you. http://www.golfcentraldaily.com/2016/04/video-bernhard-langer-demonstrates-why.html. anchoring worked for this that were desperate to find a way to putt. of course it wasn't for everybody as many out very well as it is. that doesnt make it right and now that it's outlawed he is playing a dangerous game. As John says , why are the critics "entirely" wrong ? My guess is that they are at least a little bit right and they only had etc be right once. I have just cut and pasted the link above and it does work. I suspect that you may have included the full stop after "....html". Unfortunately it is not possible to hyperlink URLs in the comments area. I understand the point that you and John are making, but I do not agree with you. Bernhard Langer has been practicing his new putting routine hundreds/thousands of times over the past 18 months, moving the grip away from his chest before making a putt. Why would he suddenly hold it against his chest, particularly as he knows that it could cost him a penalty? I am sure that you know that Bernhard Langer is a devout Christian - I believe him! My guess is Jordan Spieth has practice80 yard wedges hundreds / thousands of times too . That doesn't mean he gets it right every time. This is certainly my point - Langer has to get that one inch gap right EVERY time what are the odds on that ? I for one will take the other side of the that bet. He may think he is doing it but that is not the same as doing it. I don't buy the "he's not that sort of person argument" - often used a s defence in other sports for wrongdoing also. The discussion about De Chambeau's relief had me thinking about relief from multiple obstacles. In taking relief from a TIO he than found he was dropping the ball on the path from which he would eventually need to take further relief. Is it technically possible that a person could find themselves taking relief from 1 obstacle only to find they need to then take relief from a 2nd obstacle which puts them back to where they started ? i.e. They take relief back and forth between 2 obstacles until they get dizzy. I recommend that you read Decision 1-4/8 on the procedure that has to be followed in this situation. Briefly, the player must drop their ball from the first condition and then the second condition before determining the nearest point of relief to where their ball has come to rest after the second valid drop, where there is no interference from either condition. But check out the (long) Decision for the complete ruling.